What could I do to avoid this error? I have installed the legacy driver http://support.amd.com/us/kbarticles/Pages/catalystlegacywin8.aspx but this installer fails (when trying to install the driver). I solved the problem by going into the CCC, into Power/PowerPlay(tm) and un-checking the "Enable Vari-Bright(tm)". After clicking apply, the problem was gone. Today I did a clean install of Windows 7 on my laptop. I never had this problem before, until today. I went to system32 and deleted atibtmon.exe. At first it won't let you delete it because it is in use by the computer, but I have this brilliant and lovely tool, called UNLOCKER, and it unlocked it and deleted it for me. Problem solved. atibtmon.exe is the ATI Brightness Monitor. By default, Windows will switch to a power-saving mode when you unplug your laptop. One of the power-saving features is dimming the brightness of your laptop display. It could be that the ATI driver crashes when Windows tries to automatically adjust the brightness. Check your Windows power management settings to see if this power-saving feature is enabled on your laptop. Disabling this feature might avoid triggering the bug in the ATI driver. Since this sounds like a problem with the ATI driver, you should send a bug report to ATI so that they can release an update to fix the problem. 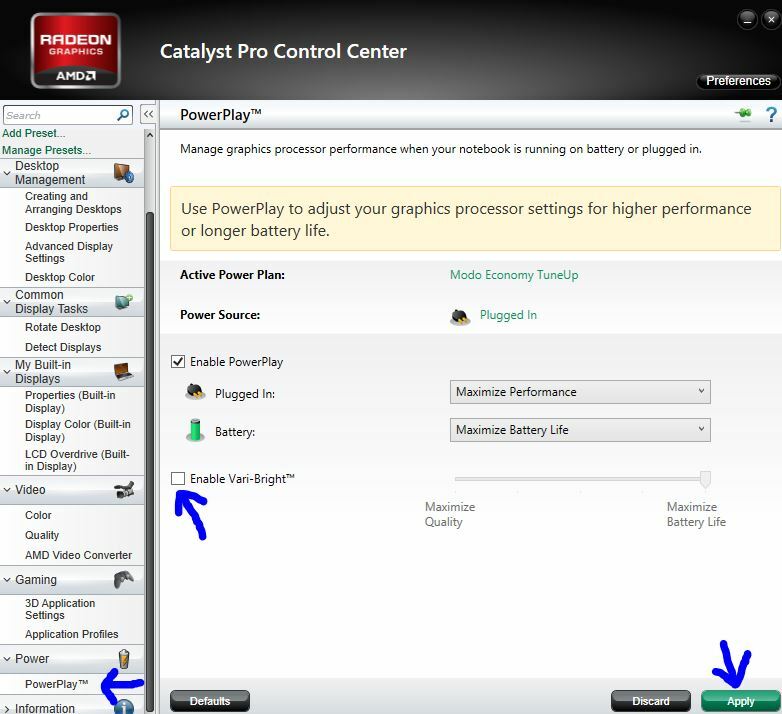 Simply disable powerplay in catalyst control center. Windows have the same option inside. On Windows 7 (or if you don't have Catalyst Control Center), go to Control Panel>>Power Options>>Change Plan Settings (whatever power play you have selected)>>Change Advanced Power Settings. Not the answer you're looking for? 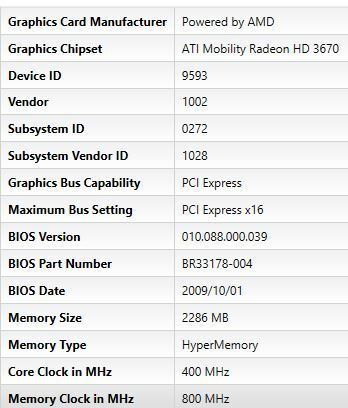 Browse other questions tagged windows-8 amd-radeon dell-xps or ask your own question. How do I disable Vari-Bright (atibtmon.exe) without Catalyst Control Center? 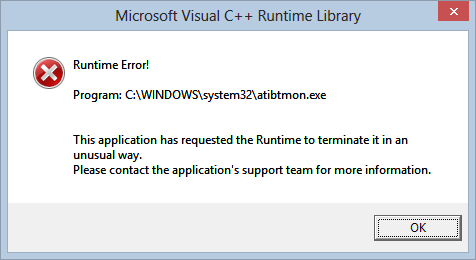 Microsoft Visual C++ Runtime Error shows up on my desktop? Excruciatingly slow graphics on Windows 8? Is this a graphics card failure?